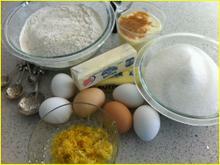 Lemon Bundt Cake, an extraordinary surprise! Many years ago my husband and I were having dinner at the home of good, long time friends. The meal was delicious and when dinner was over, my friend, Ruth, brought out a lovely Lemon Bundt Cake, causing me to inwardly cringe since strong lemon is one of the worst ten flavors in my world (not a big fan of anything sour). Appreciating the work Ruthie had done, I was determined to take a couple of bites, play with it a bit, smile and confess to being too stuffed to take another bite. Well, what a shock! I had never tasted anything quite like it; the flavor was very good with the sour balanced nicely with the sweet. And the mouth-feel was like something I had never before encountered. Dense but moist and velvety. This lovely, versatile cake has been a constant in our kitchen ever since, and I now happily share it with you! We find it useful to measure all of the Lemon Bundt Cake ingredients first, at times a couple of hours before the preparation. Make sure your butter and eggs are at room temperature. * This is important with all of your cakes. Preheat oven to 350 degrees F. With your electric mixer, paddle attachment or regular beaters, cream the Butter and Sugar on medium speed for five minutes, or until light and fluffy. 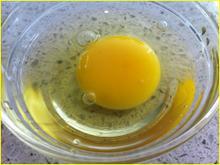 On medium speed, add eggs, one at a time (please crack eggs into an individual bowl to prevent that one in a million chance of a bad egg spoiling your work) beating well after each addition. Add lemon zest and beat until incorporated. Sift together Four, Baking Soda, Baking Powder, and Salt into a bowl. 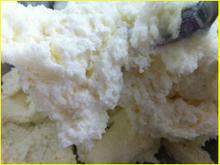 In another bowl combine buttermilk, lemon juice and vanilla. 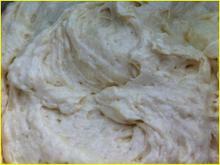 (it will look a bit curdled) Now add the flour and buttermilk alternating, starting and ending with the flour. 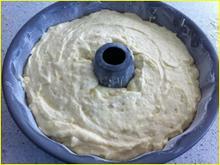 Pour Batter into a well greased and floured Bundt pan and with a spatula even it out and smooth the top. Bake for 45 minutes to 1 hour. Test with a toothpick inserted into the deepest part. It is done when it comes out clean. 1/2 C Lemon Juice over low heat until sugar dissolves. In a small bowl combine 2 C Confectioners Sugar (powdered sugar) with 1/4 C Lemon Juice and whisk until smooth and a nice consistency. Add the lemon juice a little at a time so it doesn't become too runny. When the cake is done, set it on a rack for ten minutes to cool. Remove from pan and with a tooth pick or other small pointed object (we use a thin skewer) poke holes around the top and sides of cake. Slowly pour the Thin Glaze over the top so it seeps all the way into the cake. Whoops! 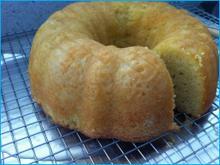 This Lemon Bundt Cake is so good that someone in this household just couldn't wait until it was finished. It's such a forgiving cake that I was able to gently push it back together and after the Decorative Glaze was poured over the top, the missing piece was just a memory. For ease in pouring the Decorative Glaze, we place it in a small plastic bag, seal it and cut a small hole in a corner which enables an even pour. 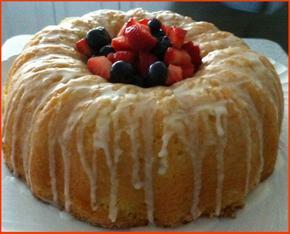 For a lovely presentation of your Lemon Bundt Cake fill the center with fresh berries or sugared grapes (optional) and you have a lovely, delicious dessert. Appreciated by friends and loved by your family!